In many ways, the depiction of light has already been a significant part of our discussion. We have already discussed the ways in which light is part of colour (tone), and part of modelling. Light, as we saw in our discussion of modelling, often comes from a specific source or direction which can often be easily identified by the viewer. The artist can, moreover, manipulate the light source to draw our attention to particular areas of the painting, or to particular objects or figures in it. In section a, we shall consider the effects of contrasts between light and dark (chiaroscuro). In section b we shall discuss the manipulation of light sources in art works. One of the most important ways in which artists can use light to achieve particular effects is in making strong contrasts between light and dark. This contrast is often described as chiaroscuro. On the other hand, a more muted effect can be generated by minimising such contrasts. 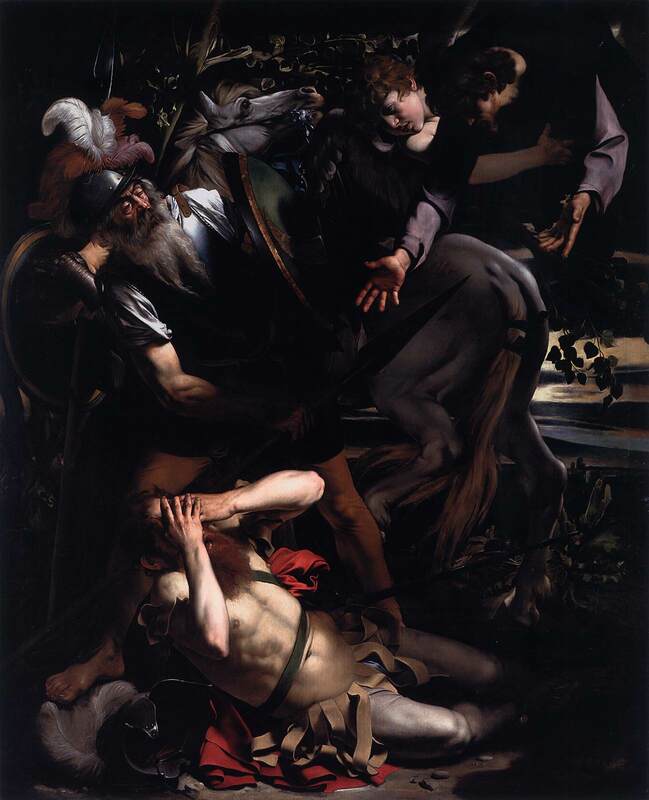 An example of a strong use of chiaroscuro is in Caravaggio's painting of the Conversion of St Paul (1600): click here (external link). Not only does the strong contrast of light and dark add dramatic intensity to the painting, and draw our attention to particular elements in the painting; it also has symbolic value, since this represents a moment of conversion away from the darkness of sin. We saw in our discussion of modelling that a single light source in a painting enhances the illusion of plasticity. But artists also generate multiple light sources, sometimes with a particular effect in mind. Look at this painting by Giovanni Girolamo Savoldo, depicting Mary Magdalene seeing Christ for the first time after the resurrection (1535-40): click here (external link). How many light sources are suggested in this painting? Why might this be? Sometimes the manipulation of light in a painting is related to its composition and other aspects of technique. In the following example, we consider a painting which we also examined in the unit on composition. 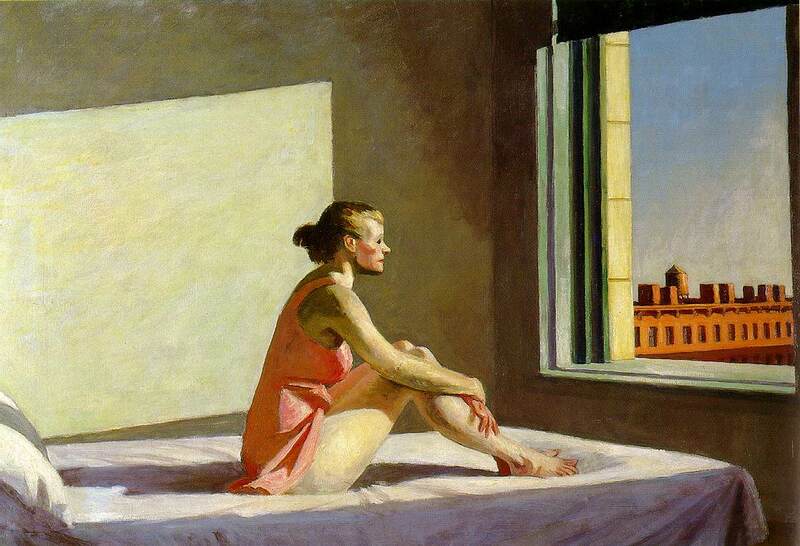 Look again at this painting by Hopper (Morning Sun (1952)), which we examined in Unit 5 when discussing composition: click here (external link). The painting is largely shaped by contrasts of light and dark. As we discussed in Unit 5, the composition of the painting is built around a vertical division into three, with the plane of the bed forming a link between the three vertical strips of the painting along the lower part. The distinction between these is largely formed by light and shade: the dark central third of the painting contrasts strongly with the light on either side of it. Strong contrasts are also evident between the figure of the woman, and the planes either side of her. How has Hopper achieved this? In this unit, we considered the importance of light in painting. Where is the light source and in which direction is it falling? Are the contrasts strong or weak? How does the artist's use of light and shade affect the mood of the painting? Is there just one light source, or are there several? If it is a narrative painting, how does the depiction of light affect our reading of the painting's narrative? In what ways does the manipulation of light relate to the composition of the painting?